Other duties include processing license holders' amendments, acquisitions, disposals, address changes, duplicates and transfers, maintain pistol license files, process pistol license suspensions and revocations, conduct criminal investigation of pistol licensees when warranted, and conduct deceased pistol licensee investigations. You may obtain new pistol license application at the Seneca County Sheriff's Office located at 6150 State Route 96, Romulus, New York 14541, OR by download and printing the forms in the box at the right. Must be a New York State/Seneca County resident. Must submit four character references using the Character Reference Form; dated within six months of your submitted application. Forms with notarization dates older than six months will be rejected. 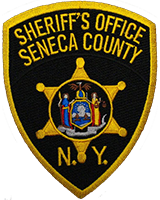 When all application paperwork has been completed, bring the paperwork to the Seneca County Sheriff’s Office, Records Division, 6150 State Route 96, Romulus, New York 14541 to review and process your application. Once your completed application has been reviewed and has been approved, your fingerprints and photograph will be taken. Note: Paperwork must be completed in black ink or typed. Any New York State Pistol License issued in Seneca County is valid until revoked or suspended. Handguns registered on the New York State Pistol License can only be carried within the restriction of the license: carry concealed, carry for employment, or sportsman. All pistol license transactions must be completed in the Records Division at the Seneca County Law Enforcement Center between 8:30 am and 2:00 pm, Monday through Friday. New applications are between 8:30 am and 2:00 pm, Monday through Friday. The pistol license holder must appear in person with their pistol license. If the weapon was bought from an individual, you must bring in a notarized bill of sale including name and address of the individual from whom the weapon was purchased and proof of a trigger lock along with a NICS check. If the weapon was purchased from a licensed gun dealer, you must bring in the sales receipt for the weapon, along with a sales receipt for the trigger lock when a new weapon has been purchased. NOTICE: A weapon will not be added onto the pistol license unless you have the necessary paperwork. There are NO exceptions to the rule. In accordance with Sections 400.05 and 265.20 of the New York State Penal Law, Executors, Administrators, or any other person(s) who have lawful possession of property, specifically handgun(s) that belonged to a New York State Pistol License holder who has died, must dispose of the handgun(s) within fifteen (15) days of the death of the pistol license holder. The handgun(s) can be disposed of to a licensed firearms dealer or to another pistol license holder. Because there are specific procedures that must be followed in these types of disposal, please contact the Pistol License Unit at (315) 220-3220, Monday through Friday, between 8:30 am and 3:30 pm. If the handgun(s) are not disposed of within the fifteen day period, the handgun(s) must be turned into a law enforcement agency, who will hold the handgun(s) for safekeeping until proper disposal can be arranged or authorization is given for destruction. The handgun(s) can only be held for a period of one year, at which time they are declared a nuisance and destroyed in accordance with New York State Penal Law.